Snails are born with rudimentary shells. On land snails, this embryonic shell can be seen even in the adult snail. 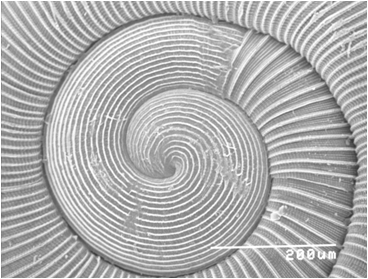 The top of the shell [about one and a half whorls] is called the Protoconch and this has a different pattern from the rest of the shell. It is often used to help identify species of snail. This is very interesting work, the patterns are very pretty.